While the Northwestern Wildcats Men's Basketball team will have the eyes of Chicago on Sunday, awaiting its first-ever NCAA tournament selection, another Chicago-area team will quietly wait for its 15th NCAA tournament berth. On Monday, March 13, join Coach Doug Bruno and the team at McGrath-Phillips Arena to watch the unveiling of the NCAA tournament brackets on DePaul's big screen. Doors open at 5 pm. A visit from mascot Dibs DePaul is mandatory, along with free food and soda. Parking is available next door to the Sullivan Athletic Center at the 2335 N. Sheffield parking facility. DePaul's 2016-17 campaign is unrivaled in the Chicago area. Ranked No. 17 in the Associated Press Top 25 national poll and No. 17 in the USA Today Coaches’ Poll, the Blue Demons come in with a 17 RPI. DePaul also compiled a 26-7 regular season record, claiming its fourth consecutive Big East regular-season title with a record of 16-2 and was runner-up at the tournament, just missing their third straight conference title. DePaul is No. 4 in the country in three-point attempts, No. 5 in assists and assists per game, No. 6 in three-pointers, No. 7 in rebounds and three-pointers per game, No. 8 in assist-turnover ratio and No. 10 in scoring offense. Jessica January is fourth in the nation in triple doubles while Kelly Campbell is No. 9 in assist-turnover ratio and Brooke Schulte No. 26 in field goals made. They excel off the court, too. According to their website, the Blue Demons have been ranked in the Women’s Basketball Coaches Association (WBCA) Academic Top 25 ten times since 2006 and finishing in the top eight in in six of the last seven seasons which included a No. 2 finish in 2013. They also earned the Big East Team Academic Award in eight of the last nine seasons for having the top team GPA. 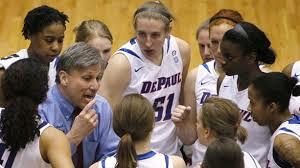 In the past three years, DePaul was named Inside Higher Education’s academic national champion twice. DePaul's women's basketball program has also produced two current WNBA players---Keshia Hampton (Minnesota Lynx) and two-time WNBA Sixth Player of the Year Allie Quigley (Chicago Sky). The NCAA Women’s Basketball Championship begins with first round play on Friday, March 17. Coverage will continue through the second round and regional finals, culminating with the Women’s Final Four from American Airlines Arena in Dallas, Texas. This year also marks the 30th anniversary of ESPN’s coverage of the women’s championship. Big 12 Oklahoma City, Okla.
Metro Atlantic Athletic Albany, N.Y. Summit League Sioux Falls, S.D.